This region is the integral membrane part of the eubacterial MgtE family of magnesium transporters. It is presumed to be an intracellular domain, that may be involved in magnesium binding. 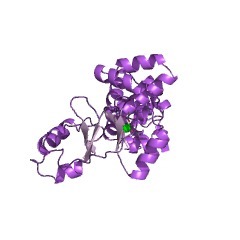 This domain is found at the N terminus of eubacterial magnesium transporters of the MgtE family IPR006667. 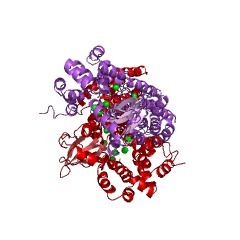 This domain is an intracellular domain that has an alpha-helical structure. The crystal structure of the MgtE transporter [(PUBMED:17700703)] shows two of 5 magnesium ions are in the interface between the N domain and the CBS domains. In the absence of magnesium there is a large shift between the N and CBS domains. There are 18016 MgtE_N domains in 17964 proteins in SMART's nrdb database. Taxonomic distribution of proteins containing MgtE_N domain. This tree includes only several representative species. The complete taxonomic breakdown of all proteins with MgtE_N domain is also avaliable. Click on the protein counts, or double click on taxonomic names to display all proteins containing MgtE_N domain in the selected taxonomic class. 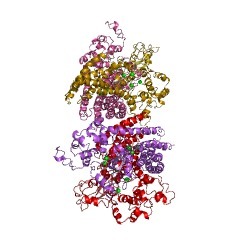 Crystal structure of the MgtE Mg2+ transporter. The magnesium ion Mg2+ is a vital element involved in numerousphysiological processes. Mg2+ has the largest hydrated radius among allcations, whereas its ionic radius is the smallest. It remains obscure howMg2+ transporters selectively recognize and dehydrate the large, fullyhydrated Mg2+ cation for transport. 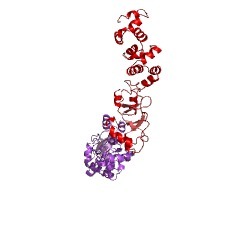 Recently the crystal structures of theCorA Mg2+ transporter were reported. The MgtE family of Mg2+ transportersis ubiquitously distributed in all phylogenetic domains, and humanhomologues have been functionally characterized and suggested to beinvolved in magnesium homeostasis. However, the MgtE transporters have notbeen thoroughly characterized. Here we determine the crystal structures ofthe full-length Thermus thermophilus MgtE at 3.5 A resolution, and of thecytosolic domain in the presence and absence of Mg2+ at 2.3 A and 3.9 Aresolutions, respectively. 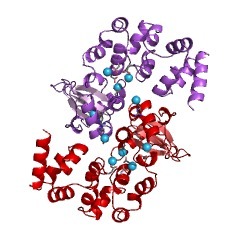 The transporter adopts a homodimericarchitecture, consisting of the carboxy-terminal five transmembranedomains and the amino-terminal cytosolic domains, which are composed ofthe superhelical N domain and tandemly repeatedcystathionine-beta-synthase domains. A solvent-accessible pore nearlytraverses the transmembrane domains, with one potential Mg2+ bound to theconserved Asp 432 within the pore. The transmembrane (TM)5 helices fromboth subunits close the pore through interactions with the 'connectinghelices', which connect the cystathionine-beta-synthase and transmembranedomains. Four putative Mg2+ ions are bound at the interface between theconnecting helices and the other domains, and this may lock the closedconformation of the pore. A structural comparison of the two states of thecytosolic domains showed the Mg2+-dependent movement of the connectinghelices, which might reorganize the transmembrane helices to open thepore. These findings suggest a homeostasis mechanism, in which Mg2+ boundbetween cytosolic domains regulates Mg2+ flux by sensing the intracellularMg2+ concentration. Whether this presumed regulation controls gating of anion channel or opening of a secondary active transporter remains to bedetermined.